Yalini is a mother, a wife, a daughter, a friend, and she is also a statistic, a patient, and – we hope – a cancer survivor. With her blessing, we are sharing her story. Yalini left Sri Lanka with her family when she was 25 years old. She relocated to Boston with her family, where she lived for five years. On a trip to Toronto in 1998, she met her future husband, Ananthan, a young college graduate, who had just accepted a job in the United States. Several months later, they were married and living in the Bay Area where Ananthan worked as a civil engineer for the City of Dublin. By 2003 they had a son and a daughter. 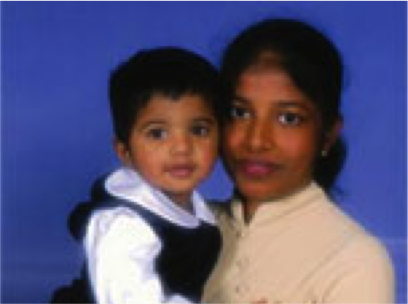 Yalini kept active being involved in her children’s school, the Sri Lankan community, and in keeping her family happy. Yalini had always been a healthy person. She eats a healthy vegetarian diet, is an active mother to two elementary school-aged kids, and had no reason to think her health was in jeopardy. However, in late 2006 at age 38, she noticed blood in her stool. No pain, nothing unusual, but blood where it shouldn’t be is never a good sign. She visited her doctor, who ran some tests. After all the routine tests were inconclusive, her doctor performed a colonoscopy and found a tumor. The tumor was biopsied and within weeks Yalini was in surgery to remove a part of her colon that contained the tumor. Three months later, her doctor ran another scan to make sure everything was as it should be, but she found another larger tumor in the abdomen. Again, within weeks, Yalini underwent another surgery to remove the abdominal tumor. The diagnosis: metastatic neuroendocrine carcinoid cancer. Very rare. Although the surgery was successful to remove the tumor from her abdomen, when a scan was done two months later, her doctors found that the cancer had spread to other organs. At this point – known as Stage 4 cancer – the disease had spread to so many vital organs that surgery was no longer an option. Since 2007, Yalini has participated in three different clinical trials at UC San Francisco in an attempt to treat the cancer with different types of chemotherapy combined with radiation. Despite these efforts, the tumors did not reduce in any noticeable way. Instead, the tumors continued to grow and new spots continue to sprout up. Treatment of this kind is not covered by insurance. Friends and family contributed most of the upfront money to get the treatment underway. But that didn’t cover the entire $96,000 and that’s when we learned about Lazarex Cancer Foundation. They have made all the difference in the world. They helped pay for the flights and accommodations in Houston, TX throughout the treatments. Through the strength she draws from her children, Yalini refuses to give up hope for a cure. Yalini has broken all the odds against her; there have been times when her family has been told to prepare for the worst and that she has three to six months to live, but she whole heartedly believes this disease will not keep her from attending her children’s graduations and from being by her husband’s side. My kids and I have their mother/wife because of you. Sadly we learned that Yalini passed on January 20, 2014. We are thankful to have been able to assist her through the last two years of her battle with cancer.